This object was found during Cotswold Archaeology’s excavations along the route of a major gas pipeline across southern Wales in 2006. It is remarkable in a number of respects; one of only 64 such objects known from Britain and one of only two known from an archaeological excavation. 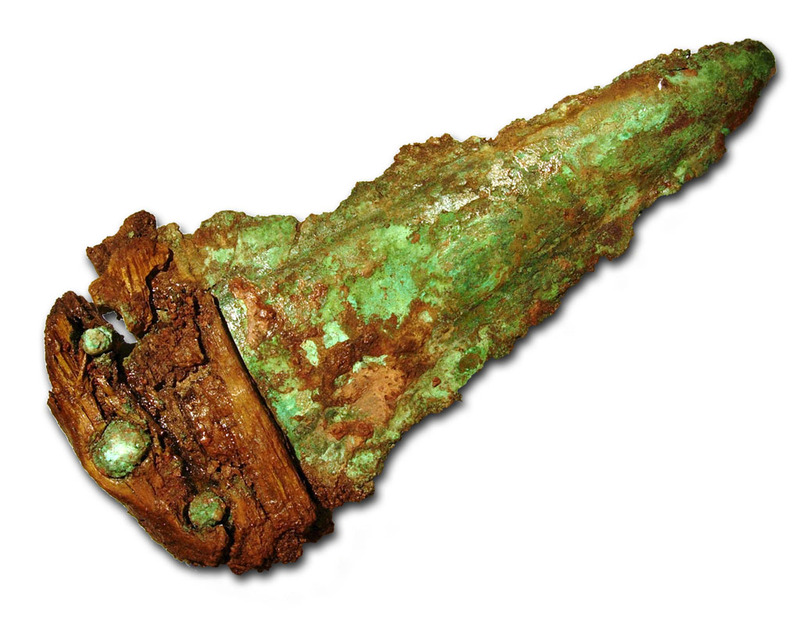 The Trecastell halberd, which analysis confirms was made of copper, was found at the top of a pit located just off centre within a ‘ring ditch’. Ring-ditches typically represent the remains of round barrows, the common method of burial in Britain during the late Neolithic and Bronze Age periods, c. 2500–1500 BC. No trace of a burial survived in the pit above which the Trecastell halberd had been placed, and some form of ‘ritual’ deposition would seem likely. Halberds are a form of weapon, with a dagger-like blade mounted more or less perpendicularly to a long wooden shaft. Unusually in this instance, part of the wooden shaft survived and the orientation of the wood grain confirmed the method of hafting. Analysis of the wood indicated that this was of hawthorn, rowan or crab apple, a hard and resilient wood commonly used for implement handles in prehistory. Halberds are the most expertly-crafted metal objects of this period, the blade probably cast in a clay mould and fixed to its haft using separately-made rivets made from thick rod. The Trecastell halberd has been studied by Dr Stuart Needham, an independent researcher, who considers it to be of a specifically Irish type which he has defined as Type Roscrea. The type is characterised by squat proportions, amongst other features, and can now be argued to be early in the insular halberd sequence with support from a radiocarbon date on part of the wooden haft of 2470–2200 Cal BC (at 95% probability). As such the Trecastell halberd is one of the earliest of this weapon class to be in use in Wales. It is also one of the very earliest scientifically-dated metal objects from Britain. With grateful thanks to Stuart Needham for commenting on the text and for the use of his image of the halberd.